Donald Trump’s team sent out an email blast this morning to the press titled “President Trump’s 100 Days of Historic Accomplishments.” The list, which includes headings such as “getting the government out of the way,” contains comparisons to what former presidents had completed at this point in their terms. The list also highlights that Trump has signed 30 executive orders since taking office in January, compared to former President Barack Obama’s 19. Trump’s email blast comes despite criticism from the president about the concept of using the first 100 days to judge effectiveness. In the last week, Trump has called the benchmark “not very meaningful” and suggested it’s overrated as a tool of evaluating a presidency. Canada has made business for our dairy farmers in Wisconsin and other border states very difficult. We will not stand for this. Watch! The two fake news polls released yesterday, ABC & NBC, while containing some very positive info, were totally wrong in General E. Watch! A new poll has some bad news for the president. Donald Trump’s approval rating is at 42 percent with just days left until he reaches his 100-day mark, according to an ABC News/Washington Post poll released Sunday. That’s the lowest for any president at this point in their term since pollsters began tracking it in the 1940s. For comparison, former President Barack Obama had a 69-percent approval rating at this juncture of his first term. Eventually, but at a later date so we can get started early, Mexico will be paying, in some form, for the badly needed border wall. I am committed to keeping our air and water clean but always remember that economic growth enhances environmental protection. Jobs matter! The president has a bone to pick with the “first 100 days” benchmark used to evaluate how a presidency is going. Donald Trump criticized the standard in a tweet Friday, calling it “ridiculous” and insinuating the media would not give him credit for his successes. Trump’s main victory since entering office, which he highlighted in his post, has been the confirmation of Supreme Court justice Neil Gorsuch. Many of his other notable moves, such as his travel ban or healthcare replacement, have failed to be instituted. No matter how much I accomplish during the ridiculous standard of the first 100 days, & it has been a lot (including S.C.), media will kill! Failing @nytimes, which has been calling me wrong for two years, just got caught in a big lie concerning New England Patriots visit to W.H. With just 10 days left of Trump’s first 100 days in office, the White House played host to the New England Patriots today. The visit is in honor of their victory earlier this year at Super Bowl LI. The president met with the team’s players and gave remarks where he singled out around seven team members for their performance. But one player not in attendance was quarterback Tom Brady, who cited personal family matters as his reason for staying home. Donald Trump has long touted his friendship with Brady, but Brady wasn’t the only player to skip. Several team members opted out of the visit due to political disagreements with the president. Dems failed in Kansas and are now failing in Georgia. Great job Karen Handel! It is now Hollywood vs. Georgia on June 20th. On Tuesday, Donald Trump signed a new executive order essentially stating “Buy American; Hire American.” The order is meant to reduce the number of low-wage foreign workers in the country and improve the amount of job opportunities for American employees. The initiative is in line with his “America First” theme for his first 100 days in office, but defies his campaign rhetoric, where he suggested it would be unfair to crack down on H1-B visa holders. Just learned that Jon @Ossoff, who is running for Congress in Georgia, doesn’t even live in the district. Republicans, get out and vote! The president stepped into campaign mode once again when he got involved in the Georgia special election. The election is being held to fill Tom Price’s congressional seat, following his confirmation as secretary of the Department of Health and Human Services. Trump began tweeting about the main Democratic candidate, Jon Ossoff, after polls made it clear that Ossoff was the leading character in the race. The district in question isn’t exactly a Republican stronghold; Trump won by less than 2 percent back in November. Nevertheless, it was expected that Ossoff would fall short of the 50 percent marker he needs to avoid a runoff election later this year. With eleven Republican candidates running in Georgia (on Tuesday) for Congress, a runoff will be a win. Vote “R” for lower taxes & safety! I did what was an almost an impossible thing to do for a Republican-easily won the Electoral College! Now Tax Returns are brought up again? The White House has announced that most of the visitor logs for those stopping by the Oval Office will remain private. Citing “grave national security risks and privacy concerns,” the Trump administration will not willingly disclose the names of the president’s vistors. Unless the White House amends this policy, it could take years for that information to be revealed. Though Republicans have long held a stance against taxpayer money being used to pay for abortion services, it’s a solution without a problem. The Hyde Amendment has prevented tax dollars from being used for abortion services for decades. Things will work out fine between the U.S.A. and Russia. At the right time everyone will come to their senses & there will be lasting peace! Jobs are returning, illegal immigration is plummeting, law, order and justice are being restored. We are truly making America great again! The White House said Tuesday that Donald Trump has seen the viral video of United Airlines passenger Dr. David Dao being forcibly deplaned and that Trump is “disturbed” by the video. White House press secretary Sean Spicer told reporters during his daily briefing that he believes anyone would be bothered by how Dao was treated. “I don’t think anyone looks at that video and isn’t a little disturbed that another human being is treated that way,” Spicer said. In an interview set to air Wednesday morning on Fox Business, the president said that the U.S. is not putting ground troops in war-torn Syria. Literally. “We’re not going into Syria,” Trump told Fox’s Maria Bartiromo. Trump’s interview comes amid questions about the White House’s next move, after he ordered missile strikes last week against a Syrian airbase. The strikes were a response to Syrian leader Bashar Assad, who is suspected of using chemical weapons against his people last week in an attack that killed dozens. North Korea is looking for trouble. If China decides to help, that would be great. If not, we will solve the problem without them! U.S.A.
Trump’s Supreme Court pick Neil Gorsuch was sworn onto the highest bench in the country Monday. His swearing in marks the president’s first landmark success with Congress since taking office. Gorsuch will serve as the late Justice Antonin Scalia’s replacement, more than a year after Scalia passed away. Gorsuch is considered very similar to Scalia in how he will decide cases, being a constitutional originalist. …confidence that President Al Sisi will handle situation properly. The reason you don’t generally hit runways is that they are easy and inexpensive to quickly fix (fill in and top)! The president ordered airstrikes on the Al-Shayrat airbase in Homs, Syria on Thursday, in retaliation for a chemical weapon attack that killed more than 100 people. The attack is suspected to be the work of Bashar Assad’s government, and these airstrikes are the first targeted U.S. action against Assad since the Syrian civil war began six years ago. Eleven weeks in, Trump says he’s had the one of the most successful 13 weeks…? Donald Trump said Thursday that he thinks his administration has had “one of the most successful 13 weeks in the history of the presidency.” There are just two problems: First, he’s had one of the most controversial terms in history to date, with multiple Cabinet picks stepping down, ongoing investigations into his campaign’s ties with Russia, a failed healthcare bill, and low poll numbers. Second, he’s only been in office for 11 weeks. White House senior adviser Steve Bannon has been removed from the National Security Council, according to reports. On Tuesday, President Trump signed an executive order reorganizing the NSC. In it, he restored the director of national intelligence, CIA director, and chairman of the Joint Chiefs of Staff to full participation and removed Bannon from the panel. The White House did not announce the move publicly, so it wasn’t reported on until Wednesday. A White House source said Bannon can still attend any meeting where his expertise is needed, CNN reported. As a reminder, Bannon has zero national security experience; rather he previously served as the publisher of alt-right white nationalist new org, Breitbart. His appointment did not require senate approval. We do not yet know why Bannon was removed, but we’re chalking it up to common sense. Donald Trump is not done tweeting about Hillary Clinton. On Monday morning, the president tweeted about his former Democratic rival and her campaign manager, saying “Was the brother of John Podesta paid big money to get the sanctions on Russia lifted? Did Hillary know?” Shortly after, he followed up with a sarcastic question about whether or not Clinton apologized for an instance where she was provided questions in advance of an interview. The tweets appear to be an attempt to deflect growing criticism of his administration’s ties with Russia. Clinton has largely remained out of the spotlight since losing the election in November. Did Hillary Clinton ever apologize for receiving the answers to the debate? Just asking! The real story turns out to be SURVEILLANCE and LEAKING! Find the leakers. When will Sleepy Eyes Chuck Todd and @NBCNews start talking about the Obama SURVEILLANCE SCANDAL and stop with the Fake Trump/Russia story? White House financial disclosures show that everyone is rich. The White House released its employees’ financial disclosures Friday night; and to no one’s surprise, they showed enormous wealth. According to the documents, senior adviser Steve Bannon has more than $1 million in his bank account and has made significant income from his rental properties. Bannon values his consulting business at somewhere between $5 and $25 million, the disclosures show. Donald Trump’s daughter Ivanka and her husband, Jared Kushner, both list far higher numbers. Because Ivanka Trump was only just given an official title, her personal disclosure hasn’t been completed yet, but her assets appear on her husband’s forms. The two could be worth as much as $740 million, reports show. Much of their fortune comes from Kushner’s real estate holdings and Trump’s business. The president’s former campaign manager, Kellyanne Conway, is also a financial success. The disclosures show that she was worth as much as $40 million before she was named a White House staffer. Donald Trump’s new enemy is… the far-right? The president revived his fight against the Freedom Caucus on Thursday morning, tweeting that the ultra-conservative congressional group would damage Republicans in 2018. Trump has been highly critical of the Caucus since they aligned against his replacement healthcare plan, despite the fact that many moderate Republicans were also opposed to the bill. The Freedom Caucus will hurt the entire Republican agenda if they don’t get on the team, & fast. We must fight them, & Dems, in 2018! Who needs the environment, anyway? If climate change was a hoax, it won’t be for long. On Tuesday, President Donald Trump signed an executive order undoing many of former President Obama’s climate change regulations. The order directs the Environmental Protection Agency to begin the process of withdrawing from the Clean Power Plan, an Obama-era regulation that called for the replacement of coal-powered plants with new wind and solar farms. The order also calls into question whether Trump will abide by the landmark Paris climate change agreements that the U.S. signed just a short time ago. The U.S. has agreed to cut its emissions by 26 percent over the next decade. Experts say such measures are essential to prevent the temperature from rising more than 3.6 degrees Fahrenheit, the temperature they agree spells global catastrophe down the line. Why doesn’t Fake News talk about Podesta ties to Russia as covered by @FoxNews or money from Russia to Clinton – sale of Uranium? The 4th Circuit Court of Appeals is reportedly considering hearing the revised travel ban case with its full bench-rather than the panel of three judges who would normally hear it. In an order on Monday, the court asked both the government and the plaintiffs to address whether the full bench should hear arguments. If all 15 active judges hear the case, it could potentially spell good new for opponents of the ban. The 4th Circuit is made up of nine Democratic appointees, five Republicans, and one appointed by a Democratic and later confirmed under a Republican. Basically: It skews left. The Democrats will make a deal with me on healthcare as soon as ObamaCare folds – not long. Do not worry, we are in very good shape! General Kelly is doing a great job at the border. Numbers are way down. Many are not even trying to come in anymore. Donald Trump’s landmark replacement for Obamacare was shot down Friday when the House of Representatives decided not to even bother voting on it. The president and Speaker of the House Paul Ryan decided to pull the bill from consideration after it became clear it would fail if it went to vote. The American Health Care Act’s rejection means that Obamacare will remain in place for the foreseeable future. Just watched the totally biased and fake news reports of the so-called Russia story on NBC and ABC. Such dishonesty! Big day for healthcare. Working hard! On Tuesday, the Trump administration announced that people flying nonstop to the U.S. from 10 airports in Muslim-majority countries would no longer be allowed to bring laptops in their carry-on luggage. Passengers are allowed to check them in with their baggage, however. The airports are spread across eight countries: Morocco, Turkey, Saudi Arabia, the United Arab Emirates, Egypt, Jordan, Kuwait and Qatar. The administration has cited the need to do so for security but didn’t say there was any specific new threat or intelligence. Several hours after the announcement, the U.K. made a similar move, though their ban affects some different airports than the U.S. ban does. Today on #NationalAgDay, we honor our great American farmers & ranchers. Their hard work & dedication are ingrained in our nation’s fabric. Comey is expected to testify about Russian involvement in November’s presidential election, which committees in both houses of Congress have been investigating. James Clapper and others stated that there is no evidence Potus colluded with Russia. This story is FAKE NEWS and everyone knows it! The real story that Congress, the FBI and all others should be looking into is the leaking of Classified information. Must find leaker now! On Sunday, Donald Trump concluded his fifth weekend in Florida since taking office. Though Trump was regularly critical of former President Obama taking vacations, he has spent more than half of his weekends as president at his Mar-a-Lago resort in Palm Beach. Trump also spent time holding meetings at his local golf club, according to his press pool, where he may have stepped out “to hit some golf balls,” the Palm Beach Post reported. Despite what you have heard from the FAKE NEWS, I had a GREAT meeting with German Chancellor Angela Merkel. Nevertheless, Germany owes…..
…vast sums of money to NATO & the United States must be paid more for the powerful, and very expensive, defense it provides to Germany! North Korea is behaving very badly. They have been “playing” the United States for years. China has done little to help! Donald Trump released his budget plan Thursday, and it cuts pretty much everything people expected. Among the agencies that would take hits are the Department of Education, the Environmental Protection Agency, PBS, the National Endowment for the Arts, the Department of Housing and Urban Development, and many more. Almost no departments are spared from cuts-the only ones without any cuts are Defense, Homeland Security and Veterans Affairs. But Trump did manage to find $2 billion for a down payment on the wall. A second judge ruled similarly in Maryland just hours later. Does anybody really believe that a reporter, who nobody ever heard of, “went to his mailbox” and found my tax returns? @NBCNews FAKE NEWS! The nonpartisan Congressional Budget Office released it’s official estimates on the GOP’s Obamacare replacement plan today, and the news wasn’t good. According to the report, it’s projected that 14 million people would lose coverage next year under the new House bill. The number of uninsured would grow to 24 million by 2026. It is amazing how rude much of the media is to my very hard working representatives. Be nice, you will do much better! Red alert! The president went an entire day without tweeting on Sunday, capping off a contentious weekend with radio silence. That may not seem notable; but as The Hill reported, Trump has tweeted more than 260 times since his inauguration, meaning he averages more than five per day. We are making great progress with healthcare. ObamaCare is imploding and will only get worse. Republicans coming together to get job done! Friday marked the halfway point in Donald Trump’s first 100 days in office, the time period generally used to determine how effective a new administration has been. In that time, Trump has signed 16 executive orders, which is on pace with former President Barack Obama. But unlike Obama, Trump’s first 50 days have been marred with controversy. Protests and court battles derailed his first travel ban, the replacement plan for Obamacare has been almost universally panned, and several members of his administration are under investigation for ties to Russian officials. Trump has made strides toward keeping some of his more realistic campaign promises. His administration has caused either the repeal or delay of more than 90 Obama-era federal regulations, and he withdrew the U.S. from the TPP trade deal. An executive order he signed allowed work to recommence on the Dakota Access Pipeline, despite ongoing protests in North Dakota. One thing Trump has not accomplished is a major legislative victory. At this point in his presidency, Obama had passed an $800 billion economic stimulus package through Congress as well as a law making it easier for women to sue over equal pay discrepancies. Trump is looking to make a repeal of the Affordable Care Act his first landmark achievement in Congress, but he has so far been unsuccessful. Despite what you hear in the press, healthcare is coming along great. We are talking to many groups and it will end in a beautiful picture! Donald Trump has chosen Jon Huntsman, a Republican who ran for president in 2012, as his ambassador to Russia. This will be Huntsman’s third ambassadorship: He represented the United States to Singapore under George H.W. Bush, and to China under Barack Obama. It will also likely be his most heavily scrutinized role, as the Trump administration is investigated for alleged ties to Russian officials during his presidential campaign. Huntsman originally endorsed Trump for office, but had called on him to drop out after the release of a vulgar tape where Trump described grabbing women to Billy Bush. I have tremendous respect for women and the many roles they serve that are vital to the fabric of our society and our economy. Donald Trump has “no regrets” about accusing former President Barack Obama of wiretapping him, at least, not according to Sean Spicer. The White House press secretary gave a news conference on Tuesday where he attempted to explain some of the president’s more controversial recent statements. Spicer said the president is waiting for the results of an investigation into his claims, despite the fact that there is no evidence to support his accusations. Spicer also touched on Trump’s claim that Obama released 122 “vicious” Guantanamo Bay inmates that have since returned to fighting. In reality, Obama released just nine of those prisoners; the other 113 were released by George W. Bush’s administration. Spicer acknowledged that Trump’s comments were incorrect. Don’t let the FAKE NEWS tell you that there is big infighting in the Trump Admin. We are getting along great, and getting major things done! Donald Trump signed a new executive order today banning people from six Muslim-majority countries from applying for visas to the United States. The new ban, which no longer includes Iraq, bars citizens from those six countries from entering the U.S. for 90 days and suspends refugee admissions for 120 days. It will also slash the number of refugee admissions for this year from 110,000 to 50,000. The new ban comes as a response to legal criticism of the first version, which argued that Trump’s ban amounted to little more than religious discrimination. It also opens the door to adding more countries. Trump will ask the Department of Homeland Security and the State Department to determine whether any other countries should be included in future travel bans, the Daily Beast reported. Donald Trump and a Russian official’s rejection of the Jeff Sessions allegations are weirdly similar. Trump went off on Twitter on Thursday night. In his tweet-storm, the POTUS attacked Democrats for what he called their “witch hunt” of Attorney General Jeff Sessions. The tweets came several hours after Sessions held a news conference recusing himself from any investigation of the Trump campaign’s ties with Russia. Jeff Sessions is an honest man. He did not say anything wrong. He could have stated his response more accurately, but it was clearly not…. …intentional. This whole narrative is a way of saving face for Democrats losing an election that everyone thought they were supposed…..
Then, Friday morning, a Russian official seemed to agree with Trump’s assessment. Foreign minister Sergei Lavrov borrowed a phrase from Trump and told a Russian state media outlet that the investigation was a “witch hunt,” Reuters reported. We should start an immediate investigation into @SenSchumer and his ties to Russia and Putin. A total hypocrite! UPDATE (2:38 PM EST): The president has spoken out. On Thursday, Trump reportedly said he has “total confidence” in Jeff Sessions and that he “doesn’t think” the attorney general should recuse himself from the investigation into possible Russian activity. ORIGINAL STORY: On Wednesday night, reports broke claiming that Attorney General Jeff Sessions spoke with the Russian ambassador twice before the November election, despite saying he didn’t during his confirmation hearing. Democrats are up in arms, demanding Sessions’ resignation from his post. Even some Republicans are saying Sessions must, at a minimum, recuse himself from investigations into whether Russia attempted to interfere in the election. And Trump hasn’t spoken out on Twitter, either. His only tweet (so far) since the news broke was an early-morning message about the stock market. Since November 8th, Election Day, the Stock Market has posted $3.2 trillion in GAINS and consumer confidence is at a 15 year high. Jobs! Donald Trump gave a speech Tuesday night in front of a joint session of Congress, where he took a much more conciliatory tone than any speech to date. In his speech, Trump discussed a healthcare overhaul, rebuilding the military and asked both sides of the aisle to put aside their fights and work together. One of the most emotional parts of his speech came as he addressed Carryn Owens, the wife of Ryan Owens, who died in a raid in Yemen shortly after Trump took office. But the speech was not devoid of his usual rhetoric: Trump also made some of his frequent claims, suggesting immigration enforcement makes us safer (studies show it drives crime up), saying 94 million people are unemployed (a misleading statistic), and claiming most terrorists are foreign-born (that’s false). A lawyer for a voting rights group said Monday that the Justice Department told them it will no longer challenge Texas’ voter ID law in court, the Associated Press reported. The move represents an about-face from the Obama administration’s stance; in 2013, former President Obama’s government joined a lawsuit challenging the statute. Last summer, a federal appeals court found that the law discriminates against minorities and the poor and ordered changes before the presidential election. The Trump administration’s position under new Attorney General Jeff Sessions is not necessarily surprising. Voter ID laws generally are divided on strict party lines. The president lost yet another one of his Cabinet appointees Sunday when Philip Bildren, his nominee for Secretary of the Navy, withdrew from consideration. Bilden cited difficulties meeting the government’s ethics guidelines and the financial sacrifice he would have to make as his reason for withdrawing. Bilden isn’t the first Trump nominee to remove themself from the running; Trump’s pick for Secretary of the Army, Vincent Viola, also dropped out over business interests earlier this month. Rumors that Bilden would quit were first reported February 18 by CBS, but White House press secretary Sean Spicer claimed on Twitter at the time that the report was false. The New York Times, CNN and Politico were among the news outlets banned from attending today’s White House press briefing-an escalation of the already historically poor relations between the media and the Trump administration. Press secretary Sean Spicer handpicked which outlets would be allowed to attend an off-camera media huddle. NBC, ABC, CBS, and Fox News were allowed to attend, along with conservative outlets like the Washington Times and Breitbart, but other outlets chose to boycott the event. The president spoke today at the Conservative Political Action Conference, known as CPAC, and repeated some of his favorite talking points. Trump used a large chunk of his speech to continue his attacks on the “mainstream media,” to criticize NAFTA, suggest that Sweden’s crime rate is going up (it’s not), and claim that intelligence agency leaks are made up. He also discussed the Affordable Care Act, saying that “Obamacare covers very few people” and claiming that many Americans had their healthcare taken away from them. In reality, roughly 20 million Americans became insured under the Affordable Care Act, and there are no reliable studies suggesting that “many” people lost their healthcare plans. Trump also spoke about Immigrations and Customs Enforcement, once again claiming that the agency endorsed him for president. Numerous outlets have debunked that claim; federal agencies cannot endorse political candidates. A union representing ICE employees did endorse Trump, but not the agency itself. White House wants the FBI to help them handle the press… Sad! White House chief of staff Reince Priebus is in hot water after asking a top FBI official to dispute reports that Trump’s campaign advisers were talking to Russian intelligence agents during the election. A White House official reportedly said Priebus made the request after hearing from the FBI that it believed a New York Times report detailing the allegations was inaccurate. The FBI has not taken a public stance on this issue. Democrats are angry about the request, arguing that the contact was inappropriate. “The White House is simply not permitted to pressure the FBI to make public statements about a pending investigation of the president and his advisers,” said Michigan Rep. John Conyers, the top Democrat on the House Judiciary Committee, the AP reported. Stop the presses. For the first time since taking office, Donald Trump made it a whole day without tweeting… sort of. The president was noticeably absent from Twitter until 5:53 PM on Thursday, when he broke his nearly 34-hour silence to tweet out a link to a Fox Business report about the stock market. Education Secretary Betsy DeVos reportedly resisted the idea at first, until Trump sided with Attorney General Jeff Sessions and asked her to drop her objection. In addition to its impact on schools throughout the country, the new guidance could affect future Supreme Court cases, particularly one scheduled to be heard next month that involves a transgender student from Virginia who was denied bathroom access. The White House released expanded immigration guidelines today that will dramatically increase the number of people targeted for deportation. Under former President Obama, immigration officials focused their efforts of undocumented immigrants who had been convicted of violent crimes. The new directives target people who have been convicted of any crime, including those who “have abused any program related to receipt of public benefits,” reported The New York Times. Bizarrely, administration officials reportedly confirmed that the U.S. plans to deport anyone who enters the country illegally from Mexico back there, even if they are not actually from Mexico. The new guidelines will not affect people under the Deferred Action for Childhood Arrivals program, but the new policy is likely to result in a major increase in deportations. Monday marked the end of the chaotic first month of Donald Trump’s presidency. In his first month in office, Trump has signed 23 executive orders, the most notable being his Muslim travel ban, which is currently mired in court proceedings. He faced his first staff shakeup just 24 days in when his national security adviser, Michael Flynn, resigned over controversial dealings with Russia. So far, he has spent one-quarter of his presidency in Florida, where he raised eyebrows for receiving a classified security briefing at a public dinner table at his Mar-a-Lago resort, and his campaign is under investigation by intelligence agencies for alleged collusion with Russia to hack the Democratic National Committee and influence the outcome of last year’s election. The White House has not yet clarified Trump’s remarks. Although Donald Trump has been in office for less than a month, he’s already kicked off his re-election campaign. Despite a difficult week in the White House, Trump held a campaign-style rally in Florida on Saturday, where he doubled down on his feud with the media-at-large and reiterated his campaign promises. The rally drew roughly 9,000 to see Trump speak but garnered criticism for taking precious time away from his duties when the White House is in flux. Trump has not yet nominated a replacement for former national security adviser Michael Flynn. The event was hosted by his campaign group rather than the White House, which is highly unusual this early in a presidency. Trump filed paperwork for his re-election bid shortly after taking office. In contrast, it took former President Obama more than two years to file for his own re-election campaign. Thank you for all of the nice statements on the Press Conference yesterday. Rush Limbaugh said one of greatest ever. Fake media not happy! Retired Vice Admiral Robert Harward turned down an offer Thursday from the Trump administration to become the new national security adviser. Harward was considered a top pick for Michael Flynn’s vacated post, and had previously served as Defense Secretary Mattis’ deputy when Mattis was in charge of U.S. Central Command. The White House said Friday that Harward turned down the offer because of the time commitment, but severalnews outlets are reporting that Harward was concerned about not being allowed to form his own team. The national security adviser role is often a highly sought-after position, so Harward’s rejection is notable. Donald Trump held a news conference this afternoon where he attacked the media (again), falsely claimed that he won the election in a landslide (again), asked a veteran black reporter if she was friends with the Congressional Black Caucus and criticized intelligence agencies for their “absolutely real [leaks]” of fake news. Trump’s conference was impromptu and puzzling, perhaps a harbinger of new media practices from the White House. Less than 24 hours after Donald Trump’s labor secretary pick Andrew Puzder withdrew his nomination, Trump is set to name a new one. He is expected to nominate Alexander Acosta, dean of Florida International University Law School. Acosta served as assistant attorney general at the Department of Justice under President George W. Bush, where he worked in the civil rights division. If confirmed, Acosta would be the first Hispanic member of Trump’s Cabinet. Of course, there is not really an option that “both parties like,” which is part of the reason the conflict has lasted more than 50 years. The Palestinians are unlikely to accept any deal that doesn’t give them a sovereign state, and Netanyahu is facing pressure from far-right members of his government to annex parts of the West Bank. Trump, for his part, did tell Netanyahu during the conference that he wants Israel to stop expanding settlements while they work on a deal and emphasized that both sides will need to compromise. But this message is somewhat undercut by Trump’s refusal to commit to a two-state solution. The Wall Street Journal reported Wednesday that U.S. intelligence officials have withheld information from Donald Trump because “they are concerned it could be leaked or compromised.” The report cites anonymous current and former officials and underscores that none of the sources know of an instance where information about security threats was withheld. This is not unheard of; intelligence agencies have withheld information from past presidents when they deemed it necessary to protect sources. What makes this instance different is the officials citing the president’s discretion as their reason for withholding. Donald Trump’s secretary of labor nominee Andrew Puzder withdrew his nomination today, just one day before he was scheduled to appear before the Senate. Puzder, a fast-food executive, had been facing growing pushback from Senate Democrats and Republicans alike after several scandals. Among them: that his family once employed an undocumented immigrant and past abuse allegations that rocketed into the public sphere after Politico obtained tape from an episode of Oprah where his ex-wife accused Puzder of leaving “permanent” damage from physical abuse. Puzder’s withdrawal is the latest blow to the Trump administration, after a chaotic week that saw the resignation of national security adviser Michael Flynn less than one month into his tenure. Several of Donald Trump’s allies, including former campaign manager Paul Manafort, were speaking with Russian officials during the election season, the New York Times reports. The “repeated contacts” between Trump allies and Russia were leaked by four current and former American officials, who intercepted the communications last year. Intelligence agencies have not yet found anything to suggest that the Trump campaign was colluding with Russia to interfere with the election, but the agencies were reportedly worried because of the amount of contact that came while Trump was speaking highly of Russian President Vladimir Putin on the campaign trail. Donald Trump is facing criticism from Democrats and security analysts after reports broke that he read sensitive documents in public at his Mar-a-Lago resort over the weekend. A member of the resort, Richard Agazio (who has since deleted his Facebook), posted photos online of Trump and Japanese Prime Minister Shinzo Abe reviewing the documents at a dinner table while staff shined cell phones lights on them. As many have pointed out, aiming an internet-connected cell phone at classified documents is extremely inappropriate, as these devices’ cameras and audio can be hacked. Furthermore, it’s troublesome that Trump chose to receive classified information in a room full of his resort guests, most of whom likely do not have security clearances. UPDATE (11:21 PM EST): National security adviser Michael Flynn abruptly resigned from office Monday night after the Justice Department told the White House it believed he could be subject to blackmail by Russian entities. Flynn was in office for less than a month when reports began to circulate that he had deliberately misled Vice President Mike Pence about a conversation he had with the Russian ambassador prior to Trump’s inauguration. Keith Kellogg will reportedly serve as the interim national security adviser until President Trump selects a new nominee. No one really knows where President Trump stands on his national security adviser, Michael Flynn. Late last week, reports surfaced suggesting Flynn misled Vice President Mike Pence about a conversation he had with Russia’s ambassador about lifting sanctions. Since then, Trump’s response-and the responses from his administration-have been mixed. Trump first suggested Friday that he was unaware of the controversy. Since then, several prominent members of his Cabinet have hedged, refusing to give a direct answer on whether Trump is considering replacing Flynn. Such an early staff shakeup would be very unusual, particularly because Trump has left the National Security Council with an unprecedented amount of vacant positions. Just leaving Florida. Big crowds of enthusiastic supporters lining the road that the FAKE NEWS media refuses to mention. Very dishonest! Hundreds arrested in immigration raids around the U.S. Hundreds of undocumented immigrants were arrested this week in raids across the country, marking the first major move toward enforcing President Trump’s campaign promise to deport the 11 million people living in the U.S. without visas. The raids, which Immigration and Customs Enforcement (ICE) called “routine,” targeted people living in New York, Los Angeles, Atlanta, Chicago and the Carolinas. Similar raids during the Obama administration targeted undocumented immigrants with criminal records. The new raids are different, because ICE officials also rounded up immigrants with no convictions. In January, Trump broadened the criteria the Department of Homeland Security can use to target undocumented immigrants, allowing them to include people with minor or no criminal records. Heading to Joint Base Andrews on #MarineOne with Prime Minister Shinzō earlier today. The 9th Circuit Court is not here for Donald Trump’s travel ban. In a unanimous decision released Thursday evening, the appeals court ruled againstthe government, meaning Trump’s ban will remain suspended. The court’s decision said that the government “had not shown a likelihood of success on its merits,” or, in other words, the appeals court doesn’t believe the law will be upheld in court. Although this is a setback for Trump’s travel ban, it is not expected to be the end of the legal battle over the executive order. The government is expected to appeal the decision to the Supreme Court. Donald Trump lashed out Wednesday at department store Nordstrom for dropping his daughter Ivanka’s fashion label, tweeting “My daughter Ivanka has been treated so unfairly by @Nordstrom. She is a great person-always pushing me to do the right thing! Terrible!” (The official POTUS account then retweeted it.) His attack on the company raised eyebrows over the ethics of the president using his platform to criticize a company over a deal with his daughter. The 9th Circuit Court of Appeals heard arguments Tuesday night over Donald Trump’s immigration ban. The government is appealing a decision handed down by U.S. District Court Judge James Robart, who ruled last Friday that the ban was temporarily suspended nationwide. The three-judge appeals court panel is expected to rule in the next few days on whether the ban should be “immediately” reinstated or if the lower court’s suspension should remain in place. If they choose not to reinstate the ban, then it’s possible that the case would move forward with Robart. However, it’s more likely that the government will appeal to the Supreme Court. Donald Trump was criticized by media Tuesday for once again citing inaccurate murder rate statistics-this time, during a speech at the National Sheriffs Association. During his speech, Trump said “the murder rate in our country is the highest it’s been in 47 years.” This is patently wrong; the murder rate in the U.S. is actually at its lowest, according to FBI crime data. Trump has been repeatedly critiqued in the past for claiming the murder rate is up but appears to be sticking with his claim. President Trump continued his attacks on the media Monday, accusing the New York Times of “making up stories [and] sources” and later accusing the press of intentionally covering up terrorist attacks in Europe. Though Trump has called the Times a “failing” newspaper regularly since he began campaigning in 2015, today’s unsubstantiated accusations are an escalation of his feud with the outlet. In the afternoon, Trump gave a speech at United States Central Command, where he suggested the media is refusing to report on terrorism in Europe. He did not specify what attacks he is referring to and offered no evidence to support this claim, but said “In many cases the very, very dishonest press doesn’t want to report it.” It’s troubling that Trump continues to attack the legitimacy of any news company that publishes negative coverage about him; earlier in the day, he called “any” negative polls about his immigration ban illegitimate. Russia is asking for an apology over comments Fox News host Bill O’Reilly made in an interview with Donald Trump that aired Sunday. In the interview, O’Reilly called Russian President Vladimir Putin “a killer,” and Trump did not disagree. He instead responded that “There are a lot of killers. We’ve got a lot of killers. What do you think? Our country’s so innocent?” Republicans and Democrats alike have criticized Trump for his refusal to condemn Putin and his authoritarian style of governing. Donald Trump said in an interview aired Sunday that a replacement for Obamacare could take “till sometime into next year,” a notable walk-back from his earlier promises to have the Affordable Care Act repealed quickly. As recently as January 11th, Trump was suggesting that former President Obama’s landmark healthcare act would be overturned as soon as his pick for secretary of health and human services was confirmed. The walk-back suggests that the protests from Americans nationwide-as well as some members of Congress-who argue that repealing Obamacare without a replacement plan would be disastrous are having an effect. The 9th Circuit Court of Appeals refused early Sunday morning to immediately reinstate Donald Trump’s immigration and travel ban, delivering a blow to the administration. Instead, the appeals court asked both sides-the Department of Justice and the State of Washington-to file legal briefs by Monday afternoon before the court makes its final decision. What this means is that the ban will remain suspended until at least Monday, and anyone affected by it can continue to enter the country. But regardless of how the appellate court rules, it is likely this case will quickly make its way to the Supreme Court. The Department of Homeland Security announced this morning that they are suspending “any and all actions implementing…the Executive Order” after a Republican-appointed federal judge suspended the ban nationwide. The State Department also announced this morning that they have begun re-issuing visas to travelers from the seven countries affected by Trump’s ban, and have notified Customs & Border Protection that approved refugees, travelers with valid visas, and green card holders are to be admitted. Trump’s press secretary Sean Spicer has already announced that the Department of Justice will appeal the court’s order. President Trump signed an executive order Friday that scales back large portions of the 2010 Dodd-Frank financial regulations, which were designed after the recession to prevent banks from speculating with consumers’ money. Trump-and the financial industry-have been critical of Dodd-Frank for a long time, with Trump promising on the campaign trail to overturn it. At a meeting with business leaders Friday, Trump said, “We expect to be cutting a lot out of Dodd-Frank, because frankly, I have so many people, friends of mine that had nice businesses, they can’t borrow money.” Though people commonly disagree over how much the financial industry should be regulated, it is noteworthy that the president has openly stated that he’s making policy to help his friends. Hawaii has reportedly joined the growing number of states suing Donald Trump over his immigration ban. The state’s attorney general, Doug Chin, announced at a press conference that they would file paperwork in court today to challenge the ban. Several other states-Washington, New York, Virginia and Massachusetts-have already filed a suit, arguing that the ban is unconstitutional. Current legal challenges against the ban surround everything from due process to the establishment clause, which prohibits laws that favor specific religions. If these challenges are successful in district court, it is likely they will be appealed and potentially make their way up to the Supreme Court. The House GOP has overturned an Obama-era gun control regulation that would have helped prevent people with documented mental illnesses from buying guns. The policy meant that people who can’t manage their finances because of a mental illness such as schizophrenia or bipolar disorder would be reported to the FBI so their names would appear during background checks. The National Rifle Association, as well as some disability advocacy groups, opposed the measure for being discriminatory-and now it’s off the table. White House senior adviser Kellyanne Conway defended Trump’s immigration in a TV interview Thursday by saying that people didn’t know “that President Obama had a six-month ban on the Iraqi refugee program after two Iraqis came here to this country, were radicalized and they were the masterminds behind the Bowling Green massacre. It didn’t get covered.” That’s true; it didn’t get covered-because it didn’t happen. First of all, former President Obama never banned Iraqi refugees. Instead, he ordered a re-vetting of more than 57,000 Iraqi refugees, which caused a temporary delay in admitting new ones. Second, there was no massacre at Bowling Green. Conway later clarified that she meant “Bowling Green terrorists,” but the two men she’s referring to-Waad Ramadan Alwan and Mohanad Shareef Hammadi, who settled in Bowling Green, Kentucky-never carried out (or even planned) an attack on U.S. soil. They were arrested for trying to get weapons to Al Qaeda in Iraq. At a press conference Thursday, White House press secretary Sean Spicer falsely claimed that Iran attacked a U.S. naval ship, which would be an act of war. In reality, the attack was carried out by Houthi rebels on a Saudi Arabian ship, the Intercept reported. Spicer’s comments were an attempt to justify the White House putting Iran “on notice” several days before, and he has not yet addressed his false statement that Iran was behind the attack. Donald Trump said at this morning’s National Prayer Breakfast that he wants to “destroy” the Johnson Amendment, a federal law that prevents tax-exempt churches from engaging in political activity. Trump had promised evangelical voters that he would overturn the amendment during his campaign, but to do so as president would require approval from Congress. It also would mark a serious move away from the separation of church and state that has been a traditional hallmark of American democracy. Trump is now feuding with Arnold Schwarzenegger. 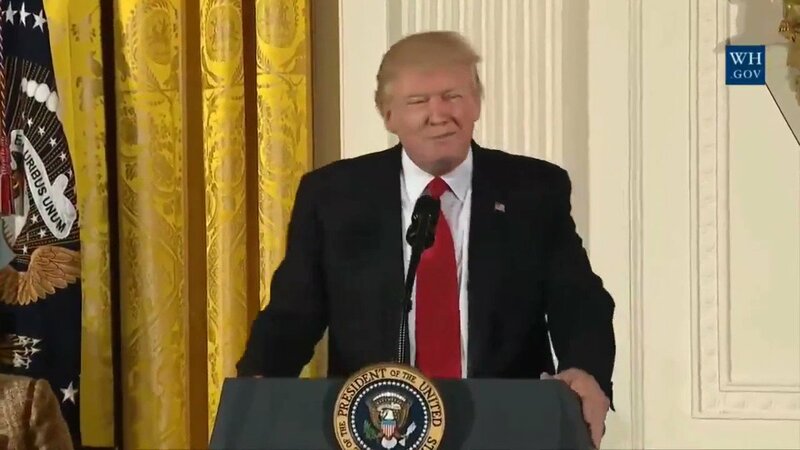 At this morning’s National Prayer Breakfast, the president referenced leaving The Apprentice and how “the ratings went right down the tubes.” He then said he wanted to pray for Arnold Schwarzenegger, “for those ratings.” Schwarzenegger, the former governor of California, fired back on Twitter, saying “Hey Donald. I have a great idea. Why don’t we switch jobs? You take over TV, cause you’re such an expert in ratings. And I take over your job, so that people can finally sleep comfortably again.” Trump’s comments may have been a joke, but they represent a departure from how former presidents have addressed the breakfast. The New York Times reported yesterday that President Trump is encouraging Senate Majority Leader Mitch McConnell to “go nuclear” with the Supreme Court vote if Democrats try to stall his pick. The so-called nuclear option would allow Republicans to approve Trump nominee Neil Gorsuch by simple majority, rather than with the traditional 60 votes. This would be an expansion of an action Democrats took in November 2013, when they used the nuclear option to eliminate filibusters on executive branch nominations and federal judicial appointments other than the Supreme Court. But Democrats are furious that Republicans are asking for a smooth confirmation process after stalling action on Obama nominee Merrick Garland for almost a full year. On Wednesday, Donald Trump threatened to break an international deal on Twitter. Do you believe it? The Obama Administration agreed to take thousands of illegal immigrants from Australia. Why? I will study this dumb deal! The tweet was the latest in a new dispute between Trump and Australian Prime Minister Malcolm Turnbull, after Trump shouted at Turnbull during a scheduled call, told Turnbull it was “the worst call by far” that he’d had with a foreign leader, and then hung up 25 minutes into what was expected to be an hourlong talk. Australia is one of the United States’ staunchest allies, so Trump’s treatment of Turnbull raised some eyebrows, and some worry this could cause a rift in the countries’ relationship. The Republican-run Senate Finance Committee approved two of Donald Trump’s Cabinet picks-Steve Mnuchin for the treasury and Tom Price for the department of health and human services-by overriding a rule that requires at least one Democrat to be present. (Democrats were boycotting the committee meeting for a second straight day.) The move is an unusual about-face from normal procedures-and will likely increase tensions between the parties. Donald Trump gave a speech today in honor of Black History Month, but spent most of it talking about himself, how he did with black voters in the election, and why CNN is “fake news.” Although Trump referenced several African-American heroes, most mentions were brief. He also seemed to claim during his speech that he got “substantially more [black votes] than other candidates who had run in the past years.” This is false; exit polls showed that Hillary Clinton won around 88 percent of the black vote. Now, the confirmation process begins in the Senate, where Gorsuch needs 60 votes-eight of which must come from Democrats-to be confirmed. The New York Times reports that Trump is meeting with his top two choices for Supreme Court nominee today ahead of his official announcement, which will take place at 8 p.m. The two judges are Neil Gorsuch and Thomas Hardiman. Despite rumors that the Trump administration had drafted a new executive order that would affect federal benefits, adoption rights, and access to services for LGBT citizens, the White House issued a statement this morning saying the president would let Obama’s protections stand. “President Trump continues to be respectful and supportive of L.G.B.T.Q. rights, just as he was throughout the election,” the statement said. Just over two hours after she told the DOJ not to defend Trump’s immigration ban, he fired her. In a press release, he claimed that Yates had “betrayed the Department of Justice” by refusing to enact the order. His administration swore in Dana Boente, U.S. attorney for the eastern district of Virginia, as her replacement. Because she doesn’t believe it’s lawful, Obama-appointed Attorney General Sally Yates-who will be replaced by Jeff Sessions if and when he’s confirmed by the Senate-told the Department of Justice not to make legal arguments defending President Trump’s immigration ban. In a tweet, the president referred to the mainstream media as “the opposition party,” an idea introduced by Steve Bannon last week in an interview with the New York Times. Trump’s ongoing feud with the media is unusual; though most presidents conflict with media outlets at some point, Trump’s statements about what the press’ role is, comments about holding reporters “accountable” for treating him “unfairly” (which is to say reporting on his actions), and repeated attacks on the legitimacy of certain legacy news outlets are a notable escalation. In a bit of reality-TV flair, President Trump teased that he will announce his Supreme Court pick tomorrow at 8 p.m. (two days earlier than originally planned, which may be an attempt to shift the news narrative away from the immigration ban). Oregon Senator Jeff Merkley also announced today that Democrats will filibuster any pick other than Merrick Garland, who was Obama’s nominee to replace the late Antonin Scalia nearly a year ago, and who Republicans have actively resisted confirming so Trump could make the pick instead. Trump signed an executive order this morning that for every new federal regulation, two must be revoked. Senior White House official Reince Priebus appeared to reverse the administration’s position on green card holders Sunday. In an interview, Priebus said that the immigration and travel ban would not apply to permanent residents “moving forward.” But he also added that people traveling to and from the listed countries-potentially including U.S. citizens-could be subject to extra questioning if Customs officials deem them “suspicious. Customs and Border Protection is reportedly ignoring the court order and continuing to detain people with valid visas at airports across the country. A federal judge ruled around 9 p.m. that the government could not return refugees to their country of origin until further legal review of the ban. Several other judges have since ruled along similar lines. The Trump administration downgraded the national director of intelligence and joint chiefs of staff from their permanent positions on the National Security Council and replaced them with White House senior adviser Steve Bannon, the former publisher of alt-right white nationalist news hub Breitbart. Restructuring the National Security Council this way puts the controversial Bannon-whose appointment to Trump’s administration did not require Senate confirmation-in a key decision-making position about war and other critical threats to the country. Thousands of protesters demonstrated across the country in reaction to what Democrats-and Trump advisor Rudy Giuliani-are referring to as the “Muslim ban,” the implementation of which has resulted in the detention of refugees and green card and visa holders at airports across the U.S. Because the executive order was drafted without the input of various government agencies, it took officials by surprise, and they’re struggling to determine who can enter the country and who, now, cannot. President Trump signed a controversial refugee ban that, under the auspices of preventing radical Islamic terrorists from committing crimes against our citizens, bars all Syrian refugees from entering the country indefinitely, halts the remaining refugee program for 120 days, and blocks any entry by citizens of Iran, Iraq, Libya, Somalia, Sudan, Syria or Yemen for 90 days, regardless of visa status. It’s worth noting that the ban excludes countries where Trump has business ties. President Trump tweeted out his support for the anti-abortion March For Life, saying their demonstration is “so important.” Vice President Mike Pence spoke at the rally, making him the highest ranked public official to ever speak at the annual March For Life event. The president’s first interview-with ABC’s David Muir-aired tonight. He doubled down on false claims about the size of his inauguration crowd and the amount of voter fraud in the United States. See the interview’s five most talked-about moments here. What remains to be seen-but is hotly contested-is who will pay for it. The president directed Immigrations and Customs Enforcement to hire 10,000 additional officers. Despite all evidence to the contrary, President Trump remains convinced that millions of Americans voted illegally in the 2016 presidential election-and maintains that none of these alleged illegal voters cast ballots for him. After reporters point out that if it were true, it would be a massive blow to democracy (and suggest that he put his money where his mouth is and investigate if he truly believes it), he announced that he will, in fact, order an investigation. Trump released a memorandum restarting construction on the Dakota Access Pipeline, which the Obama administration had effectively squashed. The Dakota Access Pipeline has faced significant opposition from environmentalists and the Standing Rock Sioux Tribe because the pipeline crosses through the Tribe’s sacred land and could impact the quality of their drinking water. President Trump released a memorandum allowing TransCanada to re-submit its petition to build the Keystone XL pipeline, which has faced serious opposition from environmental activists. Donald Trump signed a presidential memo freezing hiring on all federal government roles, excluding military and national security positions. The president has implemented a Reagan-era policy preventing foreign NGOs from receiving U.S. funds if they perform or promote abortions. This policy has flip-flopped with every recent president-Bill Clinton revoked the rule during his time in office, George W. Bush reinstated it, and Barack Obama revoked it again in 2009. Kellyanne Conway appeared on NBC’s Meet the Press and told Chuck Todd that President Trump and White House press secretary Sean Spicer’s false claims about the size of President Trump’s inaugural crowd are “alternative facts.” Shortly afterward, #alternativefacts went viral online. President Trump visited the CIA and, in front of the Memorial Wall commemorating fallen agents, gave a seemingly unscripted and wide-ranging speech. He said the media is to blame for making it sound like he “had a feud” with the agencies, although Trump personally criticized the intelligence community several times prior to the meeting. Far more than the originally estimated 200,000 people flooded the streets of the capitol (and cities around the globe) for the Women’s March, a protest of Trump’s anti-woman rhetoric and policy plans, causing the inevitable comparisons between today’s crowd and yesterday’s. At his first press briefing after the inauguration, in his first official capacity as journalists’ liaison to the White House, press secretary Sean Spicer lambasted the media for what he claims is unfair reporting about the inauguration crowd size. Watch here. Among his other day-one moves: a regulatory freeze asking agencies not to submit any new regulations and signing waivers allowing certain members of his Cabinet-such as Secretary of Defense James Mattis-to serve in his administration despite conflicts. Donald Trump’s first executive order suspends a planned decrease in mortgage rates for first-time home buyers that was announced in the final weeks of former President Obama’s term. While Republicans say the move is an effort to prevent another taxpayer bailout of Wall Street, Democrats argue that it only raises costs for low-income and middle-class home buyers. The administration also releases an executive order directing federal agencies to “waive, defer, grant exemptions from, or delay the implementation” of any part of the Affordable Care Act that creates an “economic burden” for states.